A person has been killed during a memorial procession for rapper Nipsey Hussle, with three others injured. Shots were fired as the crowd walked through Los Angeles in commemoration of the 33-year-old, who was killed in LA last month. “We must stop this senseless violence,” LAPD Chief Michael Moore said. Thousands of fans came out to celebrate the life of the Grammy-nominated musician, with Barack Obama among the people who wrote letters in tribute. The suspects fired from a grey Hyundai as the four victims paid tribute to the musician, according to police. The victims are described as three black men and one black woman between the ages of 30 and 50. Jay Z, who Nipsey worked with through his Roc Nation label, attended the memorial service at the Staples Center along with Beyonce. 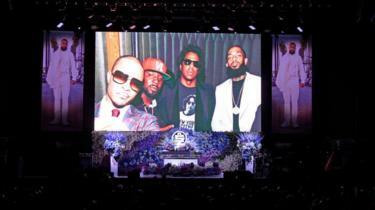 Snoop Dogg, Meek Mill and Diddy were also there to pay respect. A letter from former President Barack Obama, addressed to Nipsey’s friends and family, was read out at the service. He praised Nipsey for his community work. “His choice to invest in that community rather than ignore it – to build a skills training centre and a co-working space in Crenshaw; to lift up the Eritrean-American community; to set an example for young people to follow – is a legacy worth celebration,” he wrote. Fellow West Coast rapper and collaborator Kendrick Lamar also penned an emotional letter calling him a “true king”. 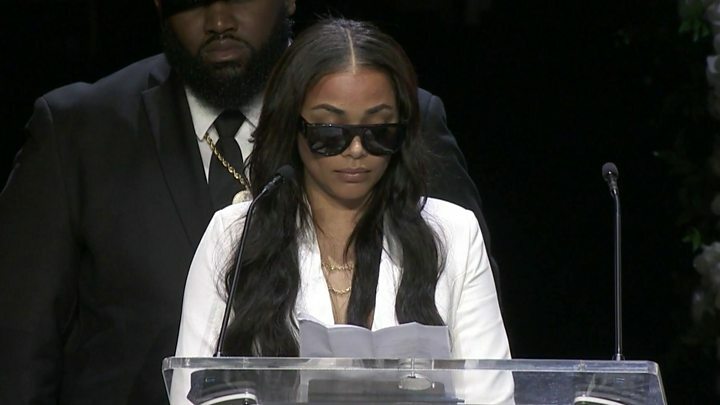 Nipsey’s girlfriend Lauren London was joined at the service by the couple’s two-year-old son Kross and her older son Kameron, whose dad is Lil Wayne. “I’d like to say something to my city Los Angeles. This pain is ours – we know what Nip meant to us. “We lost an incredible soul to us and we lost someone very rare. Next The government and Labour are continuing talks aimed at breaking the deadlock in Parliament over Brexit. Senior Conservatives are set to hold further talks on whether to change party rules to enable an early leadership challenge to Theresa May. Mr Trump said he and Twitter CEO Jack Dorsey had a "great meeting"